BACK IN 2011, when current Fianna Fáil leader Mícheál Martin stood for the leadership of his party, he proclaimed that he wanted to return to the radical roots of Fianna Fáil. This early radicalism, of course, has been overshadowed by the subsequent wideboy profit-making strategy and the repeated compromises with imperialism, both economically and politically, leading to the erosion of Irish sovereignty consequent on joining what became the European Union. But that radicalism was real and important in its day, even if Fianna Fáil was always extremely cautious, unwilling to face down reaction directly and willing to compromise at all times. It was in the 1930s that the southern state began an industrialisation programme, with state industries playing the leading role. These companies developed the commanding heights of the economy and the small private sector fed into this. Municipal housing and social welfare programmes were developed for the first time and this strengthened Fianna Fáil’s hold on the working class, a hold which it only lost in the debacle of 2011. So Martin’s declaration in the leadership race suggested a move away from the corrupting association with business, particularly in the construction industry, and a return to an earlier style of politics. But that is decidedly not what happened. 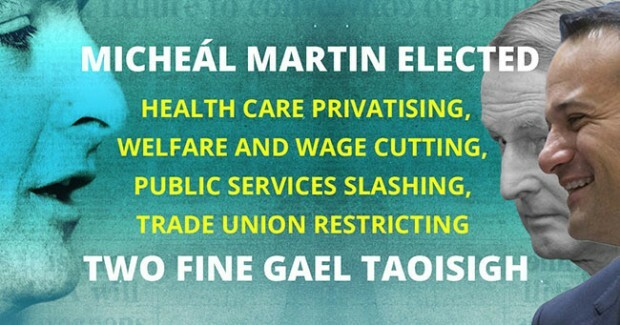 Not only is Fianna Fáil’s Martin-appointed spokesperson on finance, Michael McGrath, very much in tune with neoliberal orthodoxy, but the party has slavishly followed Fine Gael’s lead on full implementation of austerity. This reached such a pitch that Martin has shown himself willing to hang his own lieutenants out to dry when it suited him. Fianna Fáil adopted (belatedly) a position of opposition to water charges. Spokesperson Barry Cowen was given approval for his strategy in confronting Fine Gael on this, only to find Martin pulling the plug on him and surrendering to the Fine Gael position at the end. While much of this can be attributed to Martin’s blind subservience to every EU diktat (and water charges were dreamed up by the EU), he is terrified of losing support in the middle class. Fianna Fáil Head Office has made sure that potential candidates from working-class communities are frozen out. The most notable example of this is David McGuinness in Dublin West. After the 2011 debacle there was no one in Dublin West to stand for the party except for the working-class boy from Mulhuddart. But even though McGuinness showed in two by-elections that Fianna Fáil could potentially win a seat here, he was ditched and surgeon’s son Jack Chambers from leafy Castleknock stepped in. 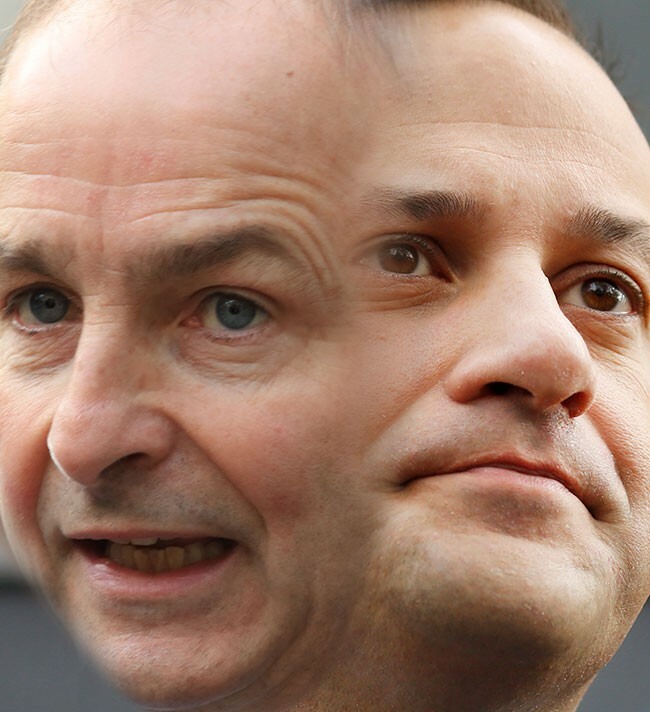 The lesson of all of this is that switching from a rampantly right-wing Fine Gael under new Thatcherite leader Leo Varadkar to Mícheál Martin’s Fianna Fáil would be no change at all. Martin is as determined as Varadkar to make sure that the middle class are kept happy at the expense, inevitably, of the working class. While Martin condemns Government housing policy, he has deliberately refrained from pushing the only real solution – municipal social housing programmes on a really big scale – showing that he intends more of the same at the heel of the hunt. 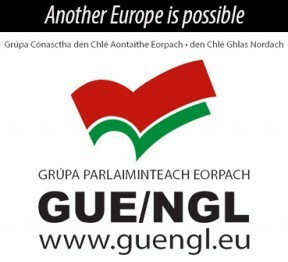 Martin is even more to the right of Fine Gael in adherence to the EU project, now intent on deeper superstate integration under the drives of France’s Emmanuel Macron and Germany’s Angela Merkel. And back home, while Varadkar postured about the national question, his lofty condemnation of Sinn Féin as the most dangerous enemy of the state (which means the most dangerous enemy to the present system of corruption and austerity) pales into insignificance beside the vitriolic anti-republican obsession of Martin. There can, of course, be only one way to advance Irish national interests re the North and that is for leading parties in the South to co-operate with Sinn Féin, now the unequivocal voice of Northern nationalism. But don’t hold your breath. Martini would prefer full-blown Orange rule to working with Sinn Féin. Hence the latest nonsense about Westminster abstentionism, even though Fianna Fáil founder Éamon de Valera stood on an abstentionist programme in the North as late as 1933 – a fact which Martin and his SF-baiting colleagues like to ignore. No, the fact is that we need to get rid of both of them, along with that dishonest Labour Party which is still champing at the bit to prop one of them up. That’s not because of their name or history. It’s because of the political programmes to which they are currently attached.